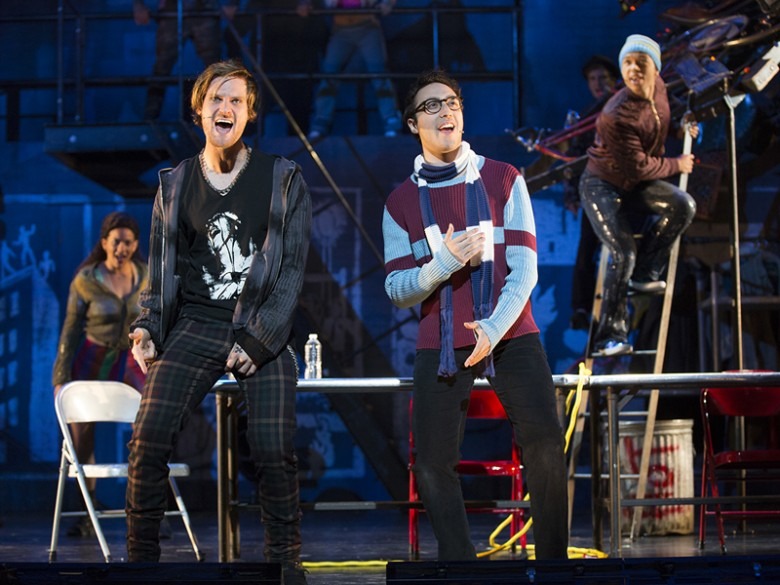 A very talented cast performs in the high energy 20th anniversary tour of Jonathan Larson’s rock opera, Rent, this week at Shea’s. Loosely based on Puccini’s opera La Bohème about 19th century starving artists in Paris facing the specter of tuberculosis, Rent tells a story of a year in the life of the youthful artistic counterculture in Alphabet City in the East Village of New York at the end of the 20th century, including a performance art-protester, civil rights lawyer, drag queen, yuppy, would-be rock-star, would-be filmmaker, strip-club dancer, anarchist professor, heroin addicts, the homeless, and the ever-present specter that hovers over them all, HIV/AIDS. However, there is also a great deal of romance going on in Alphabet City, with the attraction, desire, conflicts, and heartbreaks that this inevitably involves. Professor Collins is mugged on his way to see Mark and Roger. Angel, the drag queen, stops to help him (“You OK Honey?”) and they fall in love. Both are HIV positive. Mimi, heroin addict/dancer, knocks on Roger’s door to ask him for a match to light her candle. She pursues, he backs away in their sweet song “Light My Candle,” as their rocky relationship begins. Mark’s former lover who dumped him, Maureen, the performance artist, has hooked up with Joanne the civil-rights lawyer from a very wealthy family. Their romance is rocky as Maureen has a roving eye. Mark and Joanne commiserate in the delightful “Tango: Maureen.” They dance together while lamenting being in thrall to the charms of the performance art queen. Maureen (a very funny Lyndie Moe) appears near the end of Act One, in the ridiculous, weird, and hilarious parody of protest performance art, “Over the Moon.” She writhes and wriggles, tossing her head down and back up with her long red mane flying until she almost faints. The piece includes the dish and the spoon in the Mother Goose rhyme, but the cow is the star. Maureen even entices the audience to moo with her, all in the interest of protesting the eviction of the homeless from the tent city that abuts the warehouse. The actors excel in their roles. Javon King is outstanding as Angel, the sweet drag queen. His graceful moves are feline, as if he has no bones to hinder him. His number “Today 4 U” showcases his dancing talent. Deri’Andra Tucker also has the moves as Mimi in her number “Out Tonight,” luring men to follow her to “hit the streets” and “wail at the moon like a cat in heat,” while her profound sadness and grief pervades it all. Logan Marks is the perfect nerd and narrator as Mark, who breaks the fourth wall from the first scene on. Devinre Adams has a deep and melodious voice as the upbeat and ultimately broken-hearted Tom Collins. Joshua Bess is fine as the depressed and angry Roger, who contracted HIV from a girlfriend who later committed suicide. He mourns for the life he wasted and the one he will not have in “One Song Glory.” Lencia Kebede also is fine as the lovesick lawyer, Joanne. The grittiness of Alphabet City and the poverty of its denizens are apparent in the set and costumes. The warehouse has bicycles and other items stashed above the stage. Drawings on the back wall suggest high rises in the distance. The set becomes a funky restaurant and a street market, as well as a meeting place for the HIV support group. Costumes range from Angel’s glittery Christmas dress and white tights with black stripes to the grungy clothes of the street people, drug dealers, and hangers-on. I found the dialogue that was sung lacked a sense of rhythm or purpose at times, which made it seem as if there were no reason for the actors to be singing it rather than just speaking it as they did at other times—a minor off note in this very popular musical. There are some very amusing moments during this tragic tale. The unhappy and Scrooge-like Christmas chorus and the phone calls from various moms to their offspring by the excellent supporting cast brought laughter, as did some clever lyrics and Maureen’s performance. 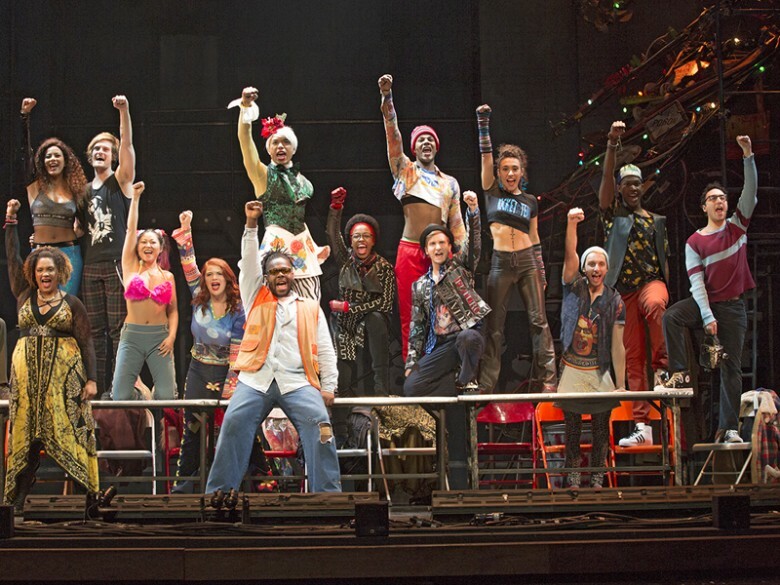 Rent had over 5000 performances on Broadway during its initial run. Its diverse cast of people who fly under the mainstream culture radar of the 1990s are reminiscent of those in Hair in the '60s, as well as the bohemians of 19th century Europe. And before them, there were others. It is a rousing, dirty-dancing, heartfelt-singing, tough, spirited and messy homage to all of them and to the ones struggling still in these troubled times. You can see Rent at Shea’s through Sunday, March 31st.